Add the salt, pepper, and cajun seasoning. Heat a medium skillet on medium-high and add the extra virgin coconut oil, making sure to coat bottom of skillet. Add egg mixture and stir as if making scrambled eggs. 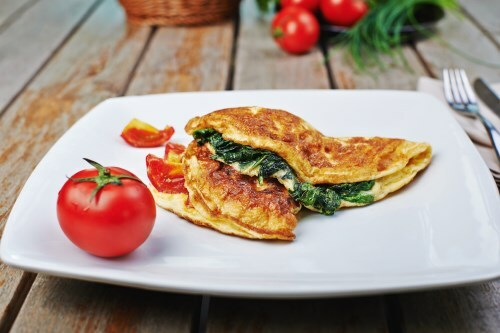 When eggs are half cooked, add fresh spinach,reduce heat, and cover. When spinach is wilted (about 3 minutes) turn off heat and sprinkle with cheese. Cover for about 2 more minutes, then serve. You can also add chopped tomatoes to this recipe. Just be sure they are well drained. Add them when you add the spinach.